Hello, lovelies! 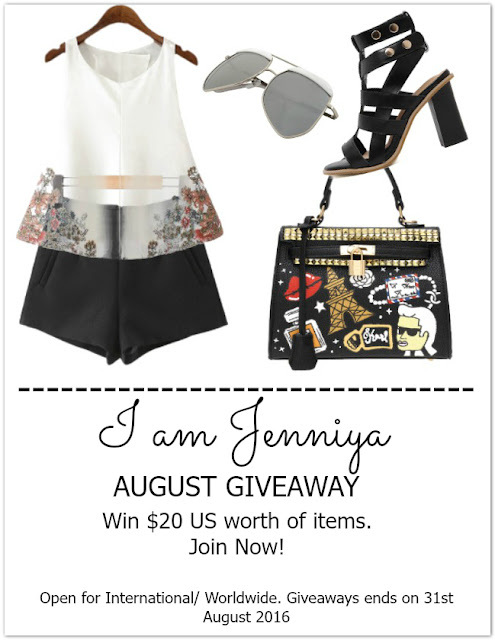 Have you joined my August Giveaway yet? If you haven't, click here to join and get a chance to win $20 worth of fashion apparel from one of my favorite online stores. For today's post, I styled a green & white ensemble which I find perfect for attending occasions that need a formal attire such as weddings. I love to attend occasions that need me to wear a floor length dress or skirt because I've got to move extra ladylike. I don't know but it makes me feel every inch a woman. I've got this green maxi skirt a few months ago and I haven't shared yet the style I came up with. The photos we took sits on my computer and eating a memory. Does it happen to you also when you don't feel the style you've created and you've done shooting it yet you just can't drop it right away because you'd think all your efforts you put to it will just go to waste? But today's post made me decide to delete the first style I created with this green skirt because I believe that today's style is better. I think this white halter top from Romwe is a perfect to pair with the green skirt. If you noticed, I put an extra effort for my make-up. I usually do not put eyeshadow but this outfit needed one, so I end up doing a smokey eye make-up but a lighter version only and not heavy. When I ordered this top, the size chart confused me. I am usually Medium but I don't know why I ordered Large. So, when I received this top, I got disappointed but there's no one to blame but me; the top is long and very loose. Then, I also realized that this top is made of cotton and embroidered, so there's no stretch on it; it is made as loose. And since I am flat-chested, there's a lot of room even. I guess I should have ordered Small size but hey, if you get blessed in the chest department, no need to order a size smaller. Anyway, I'm good in altering so I temporarily folded a few inches up and was able to wear it for this outfit post. I will have it altered by a professional tailor in the coming days. You just can't see it but the bottom part of this top is even more lovely when pulled down, see it here. I really love this halter top and there are so many occasions I could think of to wear this. I love everything! especially the pleated skirt!! You look gorgeous, love the green!